They featured this great cheat sheet from NEMA (National Electrical Manufacturers Association) that I have been meaning to feature here, so that was a nice reminder. You can also go to http://www.lightbulboptions.org/ to see the chart, if clicking on it here doesn't work. 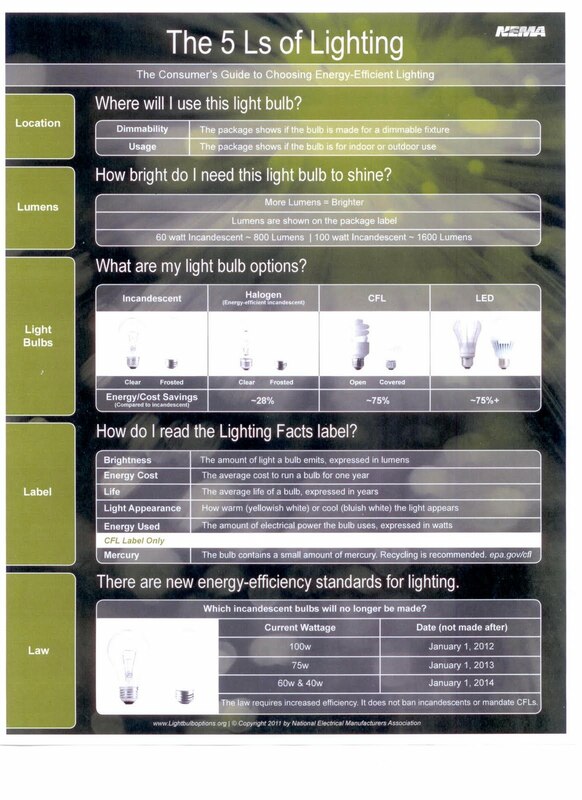 It is called the 5 Ls of Lighting, The Consumer's Guide to Choosing Energy-Efficient Lighting. 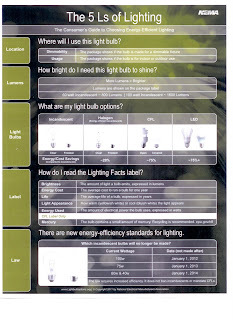 It has great tips on what to look for in a light bulb and how to understand all the new terminology. There is also a coupon for $1.00 off any Sylvania CFL or Halogen Supersaver product! The standard incandescent bulbs you currently have in your home have changed very little from Thomas Edison's first light bulb in 1879. Only 10 percent of the energy used by these standard bulbs contribute to light; the other 90 percent is wasted as heat. ENERGY STAR® -qualified CFLs use 75% less energy than an incandescent lighbulb, so they save you money. ENERGY STAR-qualified LED bulbs use 80% less energy than an incandescent lightbulb and last 25 times longer. Putting light fixtures on timers eliminates the possibility of leaving lights on when you don't need them. LED bulbs can make your life brighter and more energy efficient. Using just 12w, a replacement for your 60-watt incandescent can last 25 times longer and provide 80% energy savings. LED bulbs are instant-on, dimmable and mercury-free and are ideal for lighting your entire home, from wall sconces to table lamps to ceiling fixtures. An LED bulb is designed to replace any incandescent light bulb and meets government requirements so consumers can feel good about their lighting choices. All CFLs are not created equal. To earn the government's ENERGY STAR mark, a CFL must meet strict energy efficiency standards set by the US Environmental Protection Agency. SYLVANIA CFLs use 75% less energy and generate less heat than ordinary bulbs . The SYLVANIA ENERGY STAR qualified micro-mini Twist CFL lasts 12,000 hours or 50% longer than standard CFLs. SYLVANIA CFLs can prevent more than 400 pounds of greenhouse gas emissions each over their lifetime, the equivalent to burning 200 pounds of coal. SYLVANIA Halogen SuperSaver bulbs produce a bright light that is the same warm color as incandescent light. Halogen bulbs turn on instantly, without a warm up time. Plus, they are completely dimmable in any type of lamp. Thank you to Sylvania & NEMA for such great, easy-to-understand tips & guides!